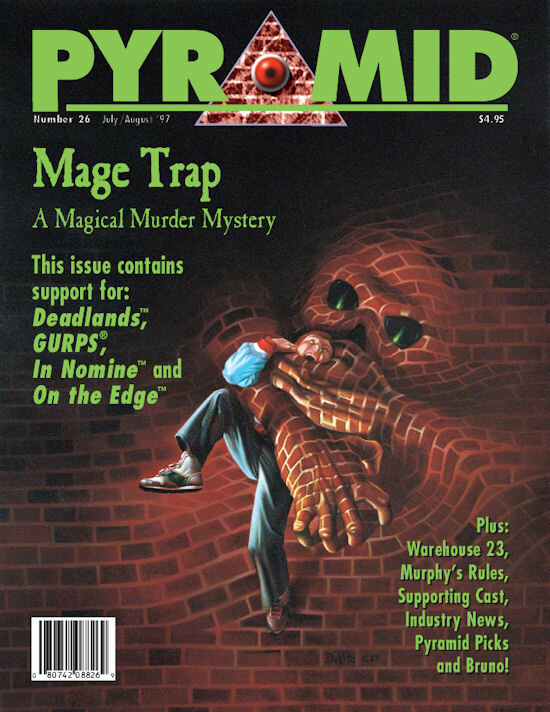 Issue 21 of Pyramid debuted in September 1996. 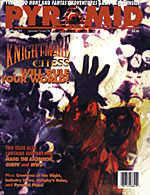 The cover story was a first look at Knightmare Chess by Steffan O'Sullivan, but the issue also has Designer's Notes for GURPS Goblins and GURPS Alternate Earths, a sneak preview of Dino Hunt by Steve Jackson, the In Nomine short story "A Bright Dream" by Derek Pearcy, the winners of the INWO Design-A-Card contest, and a complete adventure for Mage: The Ascension. And, of course, there's news, columns, Creatures of the Night, Q&A, Bruno!, Murphy's Rules, and more! The only thing missing are the free Dino Hunt and Fantasy Adventures cards promised on the cover – they're not available in this PDF. 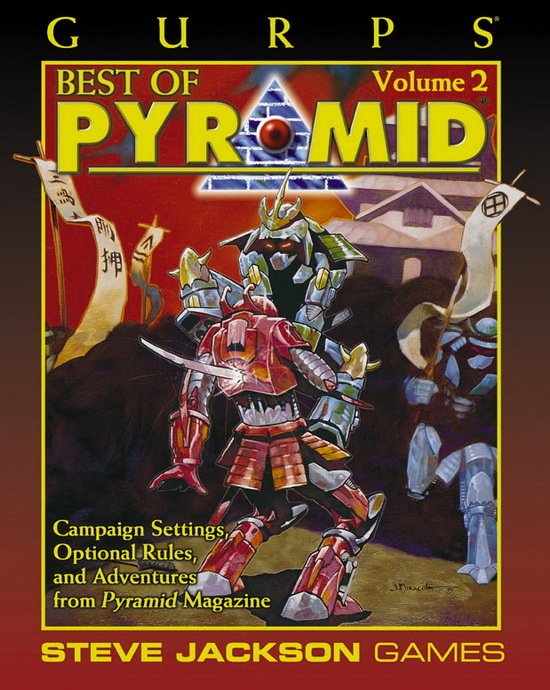 Issue 22 of Pyramid was published in November 1996. 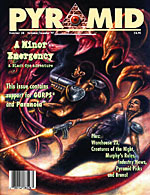 The cover story was "A Dark Dream," the second half of the In Nomine short story started in issue 21 by Derek Pearcy, but this time from the demons' point of view. Chris Pramas took a look at the Red Spears, real-life groups of Chinese peasants who banded together for protection in the early 20th century, complete with game stats and adventure ideas. This issue also had Designer's Notes for GURPS Vehicles, sneak peeks at GURPS Autoduel and Warehouse 23, and a complete adventure for GURPS IOU. And, of course, there's news, columns, Adventure Pizza, Q&A, Bruno!, Murphy's Rules, and more! 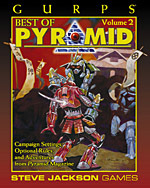 Issue 23 of Pyramid was published in January 1997. 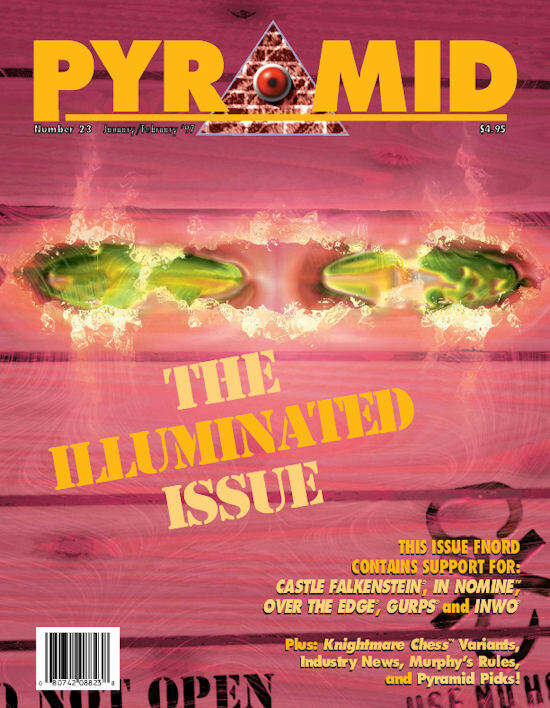 23 is a mystical number of great importance to the Illuminati and all things weird and mystical, so Issue 23 was, appropriately, the Illuminated issue. 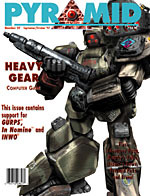 It started off with three strategy articles for INWO, a mystical adventure by S. John Ross for GURPS Warehouse 23, new spells for GURPS IOU, a crossover adventure combining Castle Falkenstein with Over the Edge, sample characters for In Nomine, rules variants and an FAQ for Knightmare Chess, and Designer's Notes for GURPS Mecha and GURPS Dinosaurs. And, of course, there's news, columns, Q&A, Bruno!, Murphy's Rules, and more! 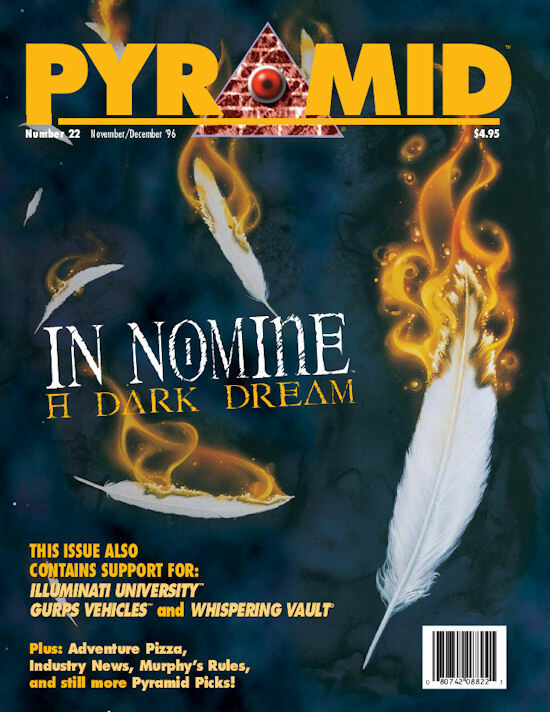 Issue 25 of Pyramid was originally released in May 1997, and features a GURPS Space adventure, and two adventures for In Nomine, plus a new character type for Warhammer Fantasy Roleplay, the latest incarnation of Traveller, a tournament update, and a visit to Warehouse 23. All that, plus the regular industry news, columns, letters, AADA News, Q&A, Supporting Cast, Bruno!, and Murphy's Rules! 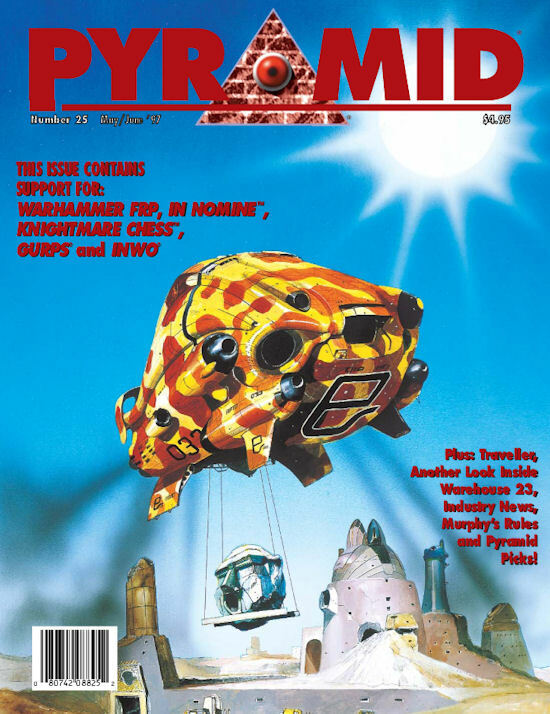 Issue 26 of Pyramid came out in July 1997. 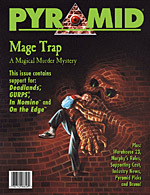 The lead article was "Mage Trap," a fantasy adventure for GURPS Magic. 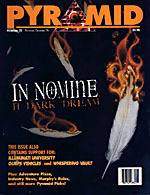 Other articles included a look at low-tech economies, In Nomine character writeups for the "Song for the Dead" adventure in issues 24 and 25, a complete adventure for Deadlands, an article for Over the Edge by author John Nephew, and a dialogue between an angel and a demon about In Nomine. On top of all that, there's the usual industry news (Wizards of the Coast buys TSR! ), letters, Q&A, Warehouse 23 and Supporting Cast, columns, Bruno!, and Murphy's Rules. 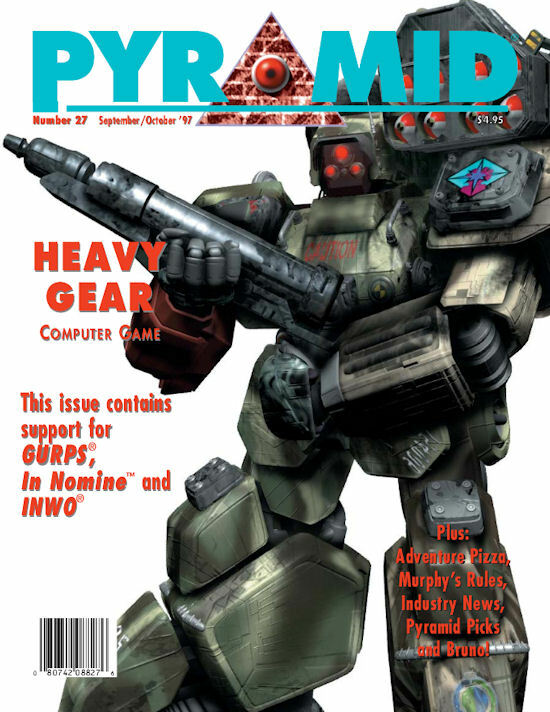 Issue 27 of Pyramid came out in September 1997, and features an in-depth look at the Heavy Gear computer game from Activision and the Dream Pod 9 RPG it was based on. There's more for In Nomine, a short adventure for GURPS Fantasy, GURPS Black Ops Designer's Notes, solitaire rules for INWO, and a look at the historical Knights Templar and Hospitaller. All that, plus industry news, columns, letters, Terra Incognita and Adventure Pizza, Q&A, Bruno!, and Murphy's Rules! 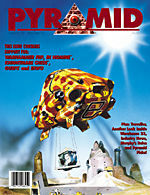 Issue 28 of Pyramid came out in November 1997. The cover story was "A Minor Emergency," a complete adventure for GURPS Black Ops by Gene Seabolt. 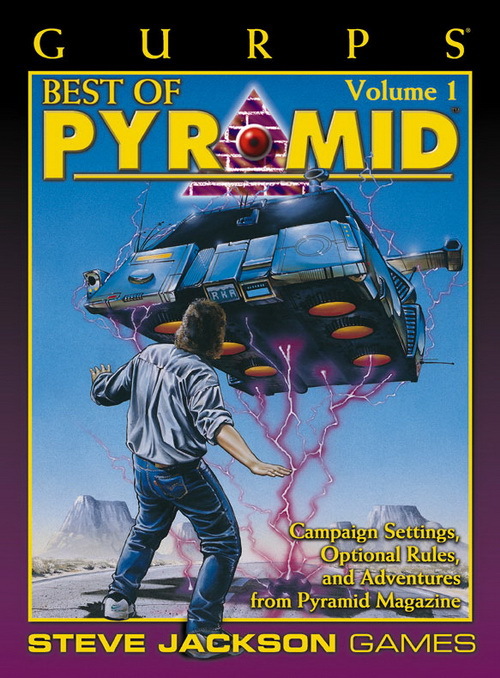 Stephen Kenson had a complete science fiction setting, "The Unity War," for GURPS or any other game, and Joshua Marquart combined Call of Cthulhu with Paranoia in "Call of Computer," an adventure where you won't know whether to laugh or scream. And, of course, there's news, columns, Creatures of the Night, Warehouse 23, Q&A, Bruno!, Murphy's Rules, and more! 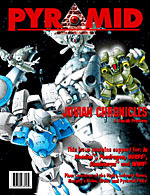 Pyramid Issue 29 was the penultimate paper issue, coming out in January 1998. 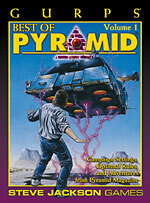 It featured "Hour of the Knife," a complete adventure for Whispering Vault, a hilarious adventure for GURPS Goblins called "Gentleman Johnson's Fish Market," articles on magic in GURPS Cyberworld, the historical realities of feudal land ownership, a new character type for Feng Shui, horrible jobs for demons in In Nomine, and Designer's Notes for both GURPS Bio-Tech and GURPS Discworld. And, of course, there's news, columns, Adventure Pizza, Q&A, Bruno!, Murphy's Rules, and more! 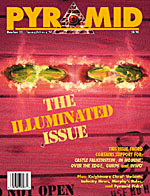 Pyramid Issue 30 was the final paper issue, bringing the five-year run to a close in March 1998. 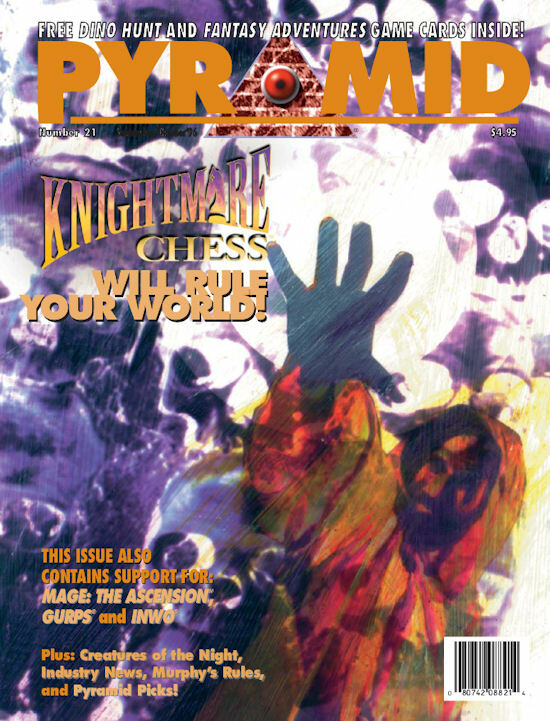 It wasn't the end of Pyramid, of course, as the publication continued – first as a weekly online gaming magazine, and then as a monthly PDF that is rocking readers to this day! 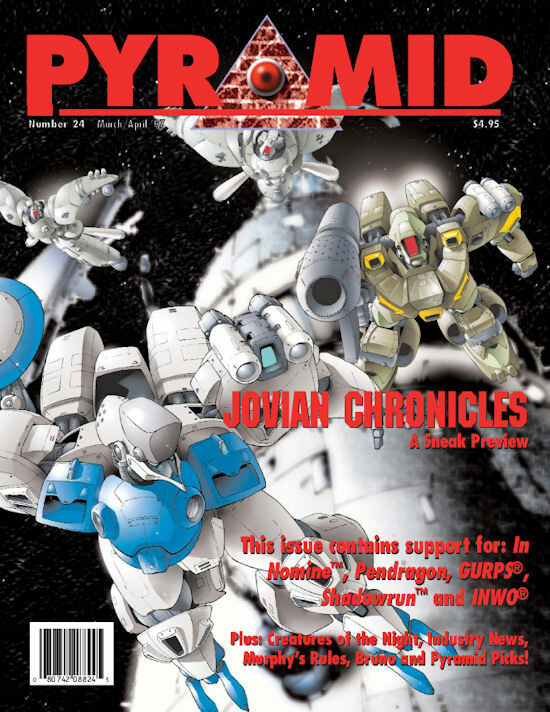 Issue 30 featured "Survival of the Fittest," a complete adventure for Shadowrun, the GURPS Cyberpunk adventure "Gothic Surf Shop," a look at autoduelling in Japan, tough jobs for angels in In Nomine, and how to acquire respect in GURPS Discworld. And, of course, there's news, columns, Warehouse 23, Q&A, Bruno!, Murphy's Rules, and more!